Itching to hop on a plane and see new sights, perhaps while earning a few credits? Well, the Daily Clog checked out the Study Abroad fair held last Friday Sept. 21 and has all the updates you need on such academic adventures. Tables were set up around the MLK Jr. Student Union’s Pauley Ballroom explaining both campus resources and specific study abroad programs. Through campus there was information on everything from international job opportunities from the Career Center, undergraduate research abroad, financial aid, passports at the RSF, specific colleges like the college of chemistry and letters and sciences and even international fire safety tips. The office of undergraduate admissions answered questions about transferring credits from the official Berkeley Study Abroad programs as well as non-Berkeley affiliated ones. The general rule is to check with advisors: ALWAYS. Confirm with undergraduate admissions if a course will transfer, and then talk to your major or college advisor to see if it can count towards a requirement. The Education Abroad Program courses should transfer automatically, but it’s always good to check. We wouldn’t want that French culture course you were counting on to fall through, even if the experience is amazing! Besides posing with Oski (conveniently waiting in one corner to be photographed with), we asked different representatives about their specific programs. The ballroom was jam-packed with Berkeley study abroad and independent ones. Countries represented included Argentina, Australia, Brazil, China, Denmark, Egypt, France, Ghana, India, Israel, Mexico, Korea, Spain, South Africa, Russia and a whole lot more we can’t even begin to list. One notable table advertised a Semester at Sea, which is exactly what it sounds like! Studying on a boat and traveling the world? Sounds like our kind of school. On a less fantastical note, when considering studying abroad, make sure to think of how long you want to stay, the language of instruction and other practical matters. 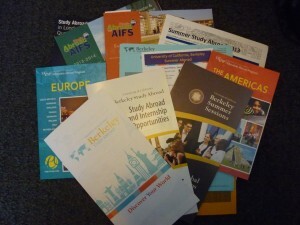 Berkeley Study Abroad has drop in advising in 160 Stephens, including specific advisors on different countries of interest. The main thing we learned from the fair? There are tons of options to choose from. Whether you’re hoping for a summer, semester or year abroad, everyone agreed you’d be in for the experience of your life. Don’t let our school’s amazing opportunities slip away! If you have room in your schedule, go for it. We give our full approval. We all want good quality headsets to listen for its beats, sometimes on the go, function, or possibly at home. Bose Noiseless Consolation 30 and Produce. Dre Fantastic Exhausted headset are two about major wifi earphones in the present sector, still so, which is best? You are generated by possibly the best good providers as well as the several other created by its excellent supplier together with rapper, Physician. Dre, of the music marketplace, who does unquestionably realize reasons for how you may really want its music that will sound like. I have got an opportunity to study journalism in Switzerland. And I am very excited about it. Gathering knowledge about abroad studies is really exciting as well. Thanks a lot. And wish me luck.